Home » News & Media »SPRING YASH IS HERE! ITS THAT TIME OF YEAR AGAIN!!! TEAM RED FOR THE WIN!! Go to the YA Scavenger Hunt page to find out all about the hunt. There are SIX contests going on simultaneously, and you can enter one or all! I am a part of the RED TEAM–but there is also a blue team, a gold team, a green team, and a purple team for a chance to win a whole different set of books! Today, I am hosting Sarvenaz Tash on my website for the YA Scavenger Hunt! 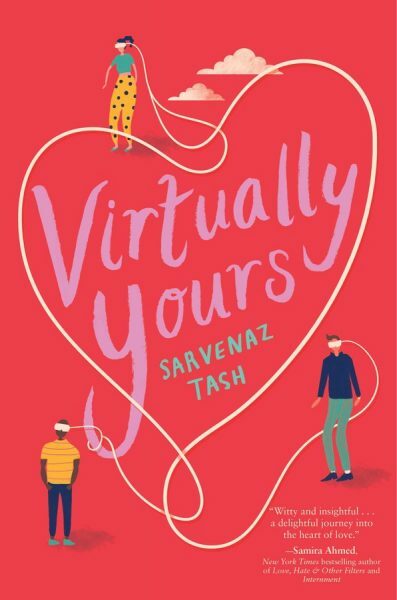 Sarvenaz Tash is the author of THE GEEK’S GUIDE TO UNREQUITED LOVE (an amazon Best Book of the Year, YALSA Top Ten Quick Pick for Reluctant YA Readers), VIRTUALLY YOURS, THREE DAY SUMMER and THE MAPMAKER AND THE GHOST. 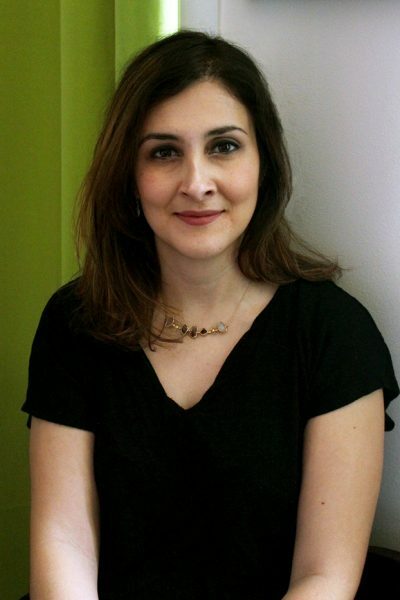 She was born in Tehran, Iran and grew up on Long Island, NY. She received her BFA in Film and Television from NYU’s Tisch School of the Arts, which means she got to spend most of college running around making movies (it was a lot of fun). She has dabbled in all sorts of writings including screen writing, copywriting, and professional tweeting for the likes of Bravo and MTV. She currently lives in Brooklyn, NE with her husband and two young sons. Find out more information by checking her out here! 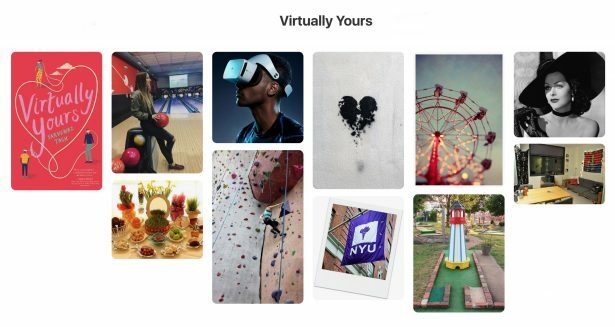 Exclusive Content — Virtually Yours MOOD BOARD! HIS SELFIE MADE ME DO IT. Yes, I had the 40 percent off coupon from the orientation fair. Yes, it was almost about to expire. Yes, my roommate, Hedy, had made a casual comment just the day before about how I never seemed to leave our room. And if I wanted to, I could use any of those as excuses for why I found myself sitting in the waiting room of HEAVR, about to place my love life in the hands of some virtual gods. But if I did, I’d be lying. Just that morning, Caleb had posted a grinning photo with a few of his college buddies, in mid-shrug—the kind of “casual” shot it probably took at least fifteen takes to get right—looking so carefree that it had sent my heart into a tailspin. There were a couple of girls in the picture too. I didn’t know if any of them meant anything more to him, but it almost didn’t matter. My ex-boyfriend, love of my life, breaker of my heart, was having the college life I should have been, and looking damn good doing it. Seeing that post had made me . . . angry. Mostly at myself. Why had I been shutting myself up in my dorm room, doing a months-long performance of the breakup mope, speaking to hardly anyone outside of my roommate? Why, especially, when Caleb was having fun. My eyes had swept across a stack of papers that was occupying a corner of my desk. At the top was the HEAVR coupon that had been gathering dust for two months. Within moments I had navigated over to their site and filled out their sign-up questionnaire—forced to glance one more time at Caleb’s selfie while I dutifully linked out to my social media profiles like it asked. Then I walked myself to HEAVR’s headquarters. I didn’t have an appointment, so now I was forced to sit in their yellow-and-magenta waiting room, staring at the “Happily Ever After Guaranteed” trademark that was plastered all over it, and trying to avoid the idle time that might make me rethink this idea. Because there was the part of me that didn’t want Caleb to be responsible for my decisions anymore. And there was the part of me that felt like love hurt too much to be worth even trying for again. And, of course, who could forget the part of me that believed in the meet-cute and wanted it to be for real, not orchestrated by a machine. But the overwhelming majority of me kept thinking: Why not? Sure, it was easy to make fun of a dating app whose name was synonymous with vomiting and to laugh at those SNL sketches mocking the very idea of VR love. But I was certainly not going to meet anyone holed away in my dorm room. Why not let a machine give it a go in an attempt to find my HEA—my happily ever after? HEAVR’s matchmaking skills were supposed to be second to none, and for a little bit extra, they’d even throw in the meet-cute. I’d splurged. I smiled brightly at the woman in the lab coat as I got up and followed her down a hallway. No sense in not being extra friendly to someone who potentially held my entire romantic future in the palm of her hand. And don’t forget to enter the contest for a chance to win a ton of books by me, Sarvenza, and more! To enter, you need to know that my favorite number is 3. Add up all the favorite numbers of the authors on the RED team and you’ll have all the secret code to enter for the grand prize! To keep going on your quest for the hunt, you need to check out the next author here! Happy Hunting!!! Want another chance to win? Enter my personal giveaway. Everyday I’ll be posting a question here. Answer it in the comments and you’ll be entered for a chance to win your own copy of NEMESIS and GENESIS! Day 4 question: What happens in the Matrix when you take the red pill and which pill would you take if you had to choose? Day 1 question comes from the song “Angel on Fire”. It’s Halsey’s Angel on Fire! Day 1: The song is “Angel on Fire”. If I recall correctly, the answer is “Angel On Fire.” And I like to capitalize the letter “o” just because I’m crazy that way. Ooooohhh! It’s from Angel on Fire! It’s coming from Angel on fire! Angel on Fire. Such a great song! The title of the Halsey song is “Angel on Fire”. Apparently it comes from the song “Angel on Fire” based on what everyone has said. Apparently I need to listen to it! It’s from Angel on Fire!! It’s from her song Angel On Fire which is one of my favourite songs! Day 1 answer is Angel on Fire. Day 2Orphan Black and Lord of the Flies. The first answer is Highlander. The other movie would be The Matrix. I’m guessing, since it’s a movie and Orphan Black and the 100 are not. 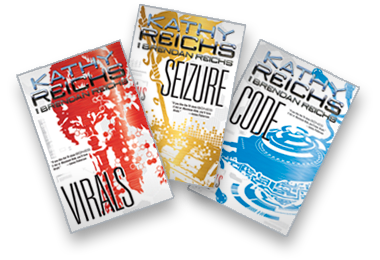 …………your MOTHER IS KATHY REICHS!? YOUR MOTHER CREATED BONES! Okay, side note: I never read the books (sorry to your mom, but when I got into the show I was like, 12.) And I loved the show so much, I remember that they would air episodes on the day of the week I had dance class, at the exact time as class. So every break I would run into the main reception area, and watch as many minutes as I could before being called back into the dance classroom!!! One of my favorite songs, Rain by Patty Griffin, came from the episode where one of Angela’s ex’s died in the desert. And one of my favorite episodes was the episode where Hodgins and Bones were in the car and Hodgins had bought really expensive perfume for his lady love (Angela) but used it so they could escape and that’s when Bones realized he had money. Sunnie Pelant, who played Christine, is a dancer, and I follow her on instagram bc dancer and cutie pie. I never read the books, I was a kid when I was into the show, and I stopped watching the show after a certain point, but up till I stopped, that show had a lot of impact on me- mostly that I couldn’t watch the show if I was eating LOLOLOL. OH OH OH OH OH!!!!! OH!!!! And in college, one of my professors who wasn’t so nice, we sat in a circle and the word “Temperance” came up and he asked the class “Does anyone know what temperance means?” So, you know, being a Bones fan since I was 12, I raised my hand and quietly mumbled (bc I was shy in that class) “abstaining from drinking” and I’m pretty sure he was surprised anyone know what that word meant (bc he clearly asked like he wasn’t expecting it), but I was proud because OF COURSE I KNEW WHAT THAT WORD MEANT xD ITS BONES’ FIRST NAME!!!!!!! xD I’ve known that word for over a decade! Day 2: Highlander & The Matrix? You are the Day 2 winner! 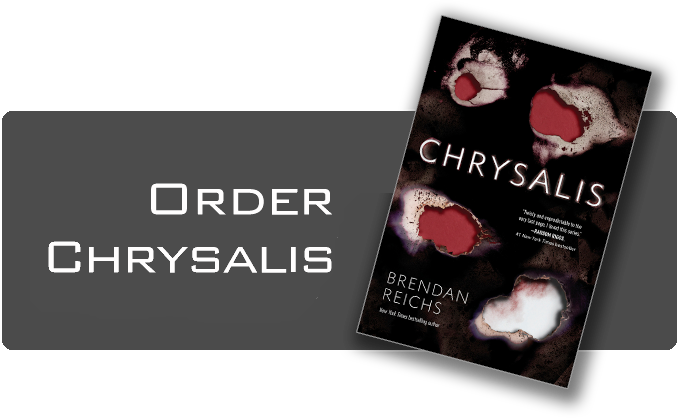 Please email your address to bcreichsasst@gmail.com! “You take the blue pill—the story ends, you wake up in your bed and believe whatever you want to believe” The blue pill is ignorance, and I guess the safety of hiding from truths that you may or may not be ready for. It’s also apparently “A life of luxurious security, tranquil happiness, and the blissful ignorance of illusion” where as take the red pill and you’re basically woke. Blue pill allows you to remain in the Matrix world, where as the red pill will pull you back to the real world. And apparently by taking the pill, in the movie, you’re basically kept as a docile sheep to farm power from and remain enslaved. Name two of the movies that inspired The Project Nemesis series! “Highlander” and….”The Matrix”! “What happens in the Matrix when you take the blue pill? ?” The blue pill will return you to your former life. You take the blue pill and you return to your life. From the Matrix: “You take the blue pill—the story ends, you wake up in your bed and believe whatever you want to believe” The blue pill is ignorance, and I guess the safety of hiding from truths that you may or may not be ready for. It’s also apparently “A life of luxurious security, tranquil happiness, and the blissful ignorance of illusion” where as take the red pill and you’re basically woke. The blue pill returns you to your life. If you take the blue pill you will continue with your life, normal, comfy life. When you take the blue pill, the story ends and you return to your normal life. Blue pill returns you to your life. If you take the blue pill from the Matrix, the story suddenly ends and you wake up back in the real world. If you take blue pill you’ll return to normal life. If you take the blue pill, you return to your normal life! If you take the blue pill, you continue in the illusion of your life as is. you will continue with your normal life. The red pill is opposite the blue pill. The red pill is when you stop ignoring reality, harsh as it is, and face facts. Your comfy cushion life is gone, and so any horrors, you’re aware of them. I do not know which color I would swallow. I’m borderline agoraphobic (severe social anxiety) and I basically only leave my house to go to therapy sessions. In that way, I’m already kind of swallowing the blue pill by hiding away from the world and not facing it. Day 4 ^^^ Whoops. I keep forgetting to add what daily question it is. The red pill represented an uncertain future, it would free you from the enslaving control of the machine-generated dream world and allow you to escape into the real world, but living the “truth of reality” is harsher and more difficult. On the other hand, the blue pill represented a beautiful prison, it would lead you back to ignorance. I would probably choose the Red Pill. “Day 4 question: What happens in the Matrix when you take the red pill and which pill would you take if you had to choose?” The red pill will show him the truth about the Matrix. I guess I would take the red pill, because if you’re deluded about being in Hell, you’re still in Hell. There’s a technical glitch with this Website/Webpage. A small minority of Websites will not give you an updated view of their page when you go to them from your browser. This is one of them. I have to click on the little “reload” button to say “Yes, I really, really want to see the current page. I really do.” The non-giving of the current view is a problem when there are updated questions such as we are getting here. So I like to see the page as it currently is, not as I saw it yesterday with this browser. Red pill equals the truth, which is the pill I hope I would choose. Thanks for the chance. I have not seen the matrix but I have heard from family that the red pill represents truth. Idk what I would choose but it is an interesting question. The truth sounds great but sometimes it’s not. It also some times changes depending on who you talk to. We won’t know about every truth out there and maybe that is a good thing. The red pill represents truth, reality. In the world of the Matrix, I wouldn’t consider myself enough of a leader to be able to deal with the truth to be honest–though I guess Neo had a team to help make him that leader. In real life, I try to be as realistic as possible, so I’d chose the red pill. The red pill represents truth. I don’t know what one I would choose if I had the option. The red pill represents truth. I would choose the red pill, hands down, no questions asked.